The commingling of humans and animals has always been a popular pastime (the latest iterations include cat cafes and selfies with bears). The interactive aspect of these trends is also evident in the latest show at Interface Gallery (486 49th St., Oakland), Feral City, which addresses misunderstandings and oversights of wildlife in our immediate surroundings, especially in urban and suburban locales throughout the Bay Area. Most people don't think twice about a trash-munching raccoon, but these animals (pests, to some) fascinate in the exhibition, which is presented by the art collective Shipping+Receiving. A binder sits on a table with several prompts: What, when, and where did you recently see a creature? Gallery-goers can also illustrate the critter they spied in a box at the bottom of the worksheet — "not that you have to stay in the box," the instructions note. One entry, done by a young boy, is a drawing of his sister. She was being too wild in the house, he said. The spaces around the gallery in Temescal Alley are also captured in the project — the collective has been setting up a motion-sensor camera at night, catching ghoulish shots of creatures with glaring eyeballs. Prints of some of them are added to the gallery walls, and have thus far included a rat followed by a cat, running through the same passageway. Impressively, the artists were even able to identify a creature in a photo from a local soccer field as a Canada goose, because of its facial markings. Feral City isn't just a collection of natural history museum data. The show also includes wildlife trading cards with Saved by the Bell-esque geometric patterns and vivid color combinations. On the back of the cards are research findings of the creatures, such as how they've adapted to city life, mixed with goofy details like the nickname of the Cross Orbweaver spider (Sir Weaves-a-Lot) and its favorite music (TLC). 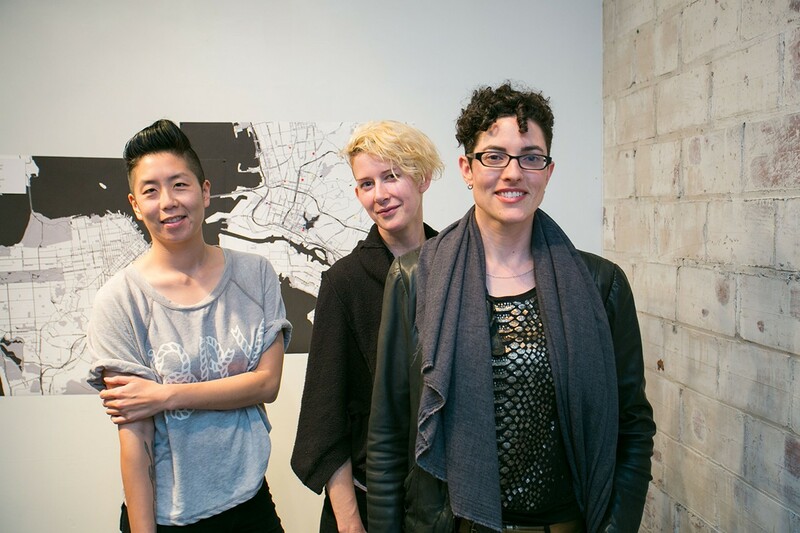 The three artists in the collective are Heather Smith, Torreya Cummings, and Audrey Nieh. 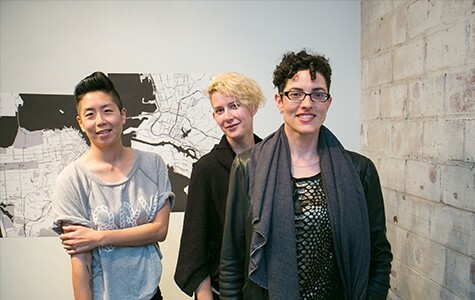 Suzanne L'Heureux, curator of Interface Gallery, received a grant from Southern Exposure last year, and Feral City is the second of three month-long shows emphasizing community exchange. In the past, the collective has organized similarly interactive happenings, such as its California vs. California wrestling matches, in which participants dressed as California stereotypes and icons — such as Dianne Feinstein and "DotCom" — fought after a ten-minute training session. Cummings will host talks each Sunday, and on November 16, the event will feature readings from Nathanael Johnson, an author and journalist who wrote the book All Natural, articles such as "The Revolution Will Not Be Pasteurized," and is currently working on a book about urban wildlife. A map on the wall already hosts a smattering of pushpins and colored dots, marking where people have spotted various species around the Bay Area. During the show's run, additions to the exhibit — the prints from the hidden camera, the map, animal sightings — will make for a unique experience and education for each viewer. Most of all, the show ponders how we got to a place and time in which urban wildlife prospers, and considers what may be next. Through Nov. 30, free. InterfaceArtGallery.com or 510-990-8028. The local podcast seeks to radicalize the Bay Area art scene with humor (and swearing).